One of the more interesting things about the Guatemalan chucho (mutt) is that they so clearly choose the people in their lives. Chuchos have a way of causing love at first sight with a magical look into the eyes of unsuspecting humans. 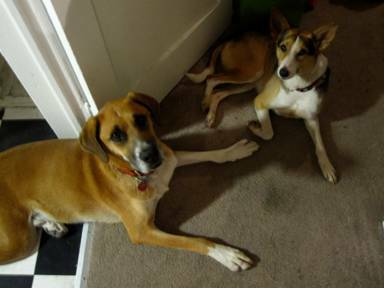 It is not uncommon for a single individual to be drawn from a crowd by the sudden appearance of a chucho at their feet. Such was the experience for visiting volunteer Corinne. Corinne came to Panajachel with a team of co-workers through a Whole Foods community service program. Their multi-week mission was to teach English and find opportunities to help people in need. During their off-hours the team spent most of their time together shopping and in the local cafes. But when they first met street dog Alicia it was clearly Corinne who became the chosen one. Alicia has been part of Ayuda’s program for some time now. 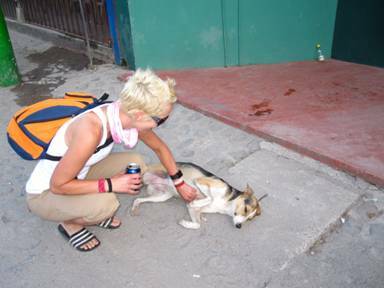 This homeless girl has experienced our standard medical treatments, including sterilization and vaccination series. Alicia’s daily haunt has been on the sidewalk just outside the Salvadoran Pupusaria restaurant, where Ayuda volunteers and other members of the community have regularly watched over her. After a few days of Alicia finding her new friend wherever she was, Corinne knew that the two of them were meant to be together. She contacted Ayuda and asked for help with legalities and transportation issues to bring the Guatemalan street dog to her home in the US. Being the rainy season and for safe keeping, Selaine and Harold fostered Alicia in their home while travel arrangements were made. Through Dr. Miguel’s assistance and through networking with friends at Unidos Para los Animales, all went well for Alicia’s flight to her new world. But the surprises weren’t over for Corinne. Once the plane had landed she was met by her boyfriend who sweetly proposed to her in the airport! Congratulations to all on a true Fairy Tale Ending! Note: Alicia is now named Maya and has settled in nicely with her new Salt Lake City family that includes the happy couples other dog, Trooper. Look for more pictures of Maya and her adventure in our photo stream. Hi Catherine! Yes, Whole Foods Market has a nonprofit organization called Whole Planet Foundation where we give microloans to women in developing countries to help empower them to lift themselves out of poverty! We have a Team Member Volunteer Program where Team Members can help with the projects, such as the one in Guatemala, through Whole Planet Foundation. We also run a Prosperity Campaign every March where every Whole Foods Market raises donations for Whole Planet Foundation to continue it’s vital work in the world! Check it out at http://www.wholeplanetfoundation.org! Wow, another happy ending. These feel good stories never get old. Keep them coming. maya and Trooper seem to be a great pair.